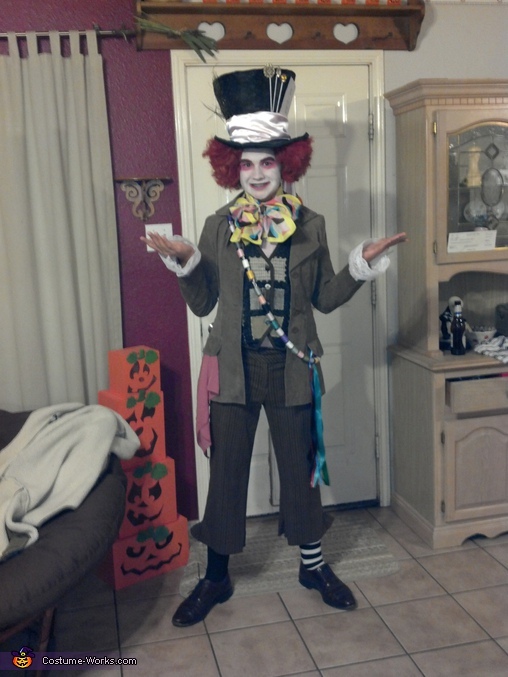 My 14yr old dressed as the mad hatter, Tim Burton style. The hat was made from a felt St. Patties day hat that was lined with cardboard and some styrofoam in the top to stiffen it. Then we covered it in fabric and embellished it. The hat pins are bbq scewers we pained silver and hot glued plastic jewels to. Most of the clothes came from second hand stores. The lace on the sleeves we sewed on. The thread spool sash we made from two travel sew kits. The wig was blonde and we spraypainted it red and gave it a haircut. Tons of fun. Im gonna wear it next year!